Picking the best flooring option is a surprisingly detailed oriented process that goes beyond picking a type, colour and installation method. There are five common mistakes that are often overlooked but 100% avoidable with a bit of education. The thickness of your old floor needs to be considered while picking new flooring. 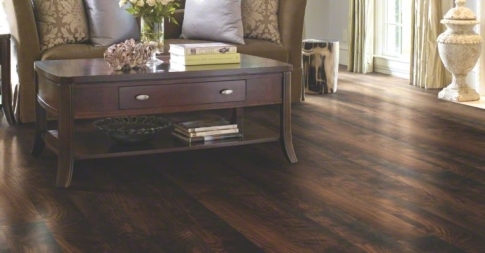 Picking flooring with the same thickness is the easiest, hassle-free option for most people. Switching to flooring with a different thickness can be done but a few implications need to be considered before picking. Repaint the wall to cover up the line in between. When replacing the baseboards, install a slightly taller baseboard. Keep the baseboards at their previous height and install base shoe to cover the gap between the flooring and baseboards. When new flooring is thicker, there is a risk of doors scraping against the flooring. Some door professionals can cut down doors so they will fit. Similar to doors, thicker flooring may require door casings to be removed and cut down to fit. If your flooring was installed under cabinets or appliances, a thicker floor will raise all items on top of it. As an example, if your stove was level with the height of the countertops, it may no longer be level when you install the thicker flooring under the stove but not the countertops. 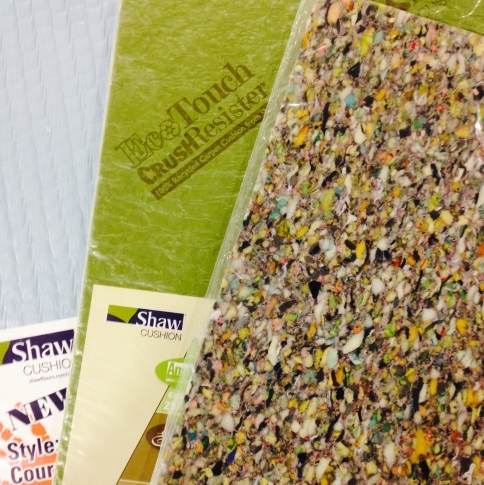 Different types of Shaw carpet pad. The pad on the right is an inexpensive chip foam. The other two options have moisture barriers. The underpad you put below the carpet is just as important as the carpet itself. A high-quality carpet pad is essential for extending the life of your carpet. Carpet pad with a built-in moisture barrier helps to prevent stains from soaking into the pad and reappearing on the carpet. If you live in a condo building, your strata may require an underpad with a specific sound rating. Since it is always easier to ask for permission than forgiveness, we recommend finding out what underpad sound ratings your strata requires before purchasing. Our article about underlay requirements for condos provides more in-depth information on the subject. A crucial step in selecting flooring is considering the amount and type of traffic your house has. To determine the best type of flooring, we always ask our customers questions about their lifestyle. What kind of traffic does this area see? Do you have kids or pets? These questions help us determine how much wear and tear your floor will experience in its lifetime. High traffic areas or households with kids and pets are more prone to scratches, marks and other imperfections. A floor with a matte finish or distressing hides imperfections a bit better than a high-gloss piano finish floor does. If you have a high traffic household and hate scratches and imperfections, a high gloss floor is not recommended. When removing existing flooring, there can often be big surprises underneath. The subfloor may need to be replaced or levelled to meet the manufacturer’s subfloor requirements for your flooring. Your flooring contractor can provide you with a rough estimate of the costs for subfloor prep and levelling. Keep in mind that this will only be a rough estimate – it is impossible to provide a 100% accurate estimate until we can see the entire subfloor. The cleaning and maintenance of a floor is often overlooked when making a flooring decision. With flooring, it is always good to consider the lifetime cost of the floor, both in terms of dollars and time. Hate vacuuming? Take out that carpet and replace it with a hard surface. The lifetime cost of maintaining the floor is especially important for commercial flooring products. While some floors may be cheap to purchase, the cost of cleaning products, sealing, buffing and waxing the floor could total more than the maintenance for a more expensive floor. By not learning about the maintenance costs, your floor could end up costing you more in the long run. Our flooring maintenance guides can provide an overview of the maintenance required. To compare the true costs of the floor, ask your salesperson about the maintenance required for each flooring option you’re considering.